7inova 7U300A USB Wireless-N USB 2.0 Adapter complies with IEEE 802.11n/g/b standards and 2.4G frequency, enables wireless internet access to either your desktop or notebook PC, designed to provide 300Mbps speed(2T2R). It is with 2dbi detachable antenna, give you more flexibility to rotate when you stronger signal is needed. Add high-speed 2.4G Wireless-N Internet access to any USB enabled computer. Supports 64b/128bit WEP, WPA and WPA2 (TKIP+AES) to prevent unauthorized users to access your wireless network. Get wireless speeds ideal for surfing, emailing and instant messaging-up to 300Mbps. Supports USB 2.0 interface,with 2dbi rotatable antenna for better performance. WIN8,WIN7,WINDOWS 2000, XP 32/64-BIT, VISTA 32/64-BIT. For simple tasks like emailing or web surfing, 2.4GHz band is enough to us, if you have high request in speed for HD video streaming, suggest to use 5G frequency model. 7inova warrants this 7inova-branded 300Mbps Wireless 802.11n USB adapter against defects in materials and workmanship under normal use for ONE YEAR from purchase date. 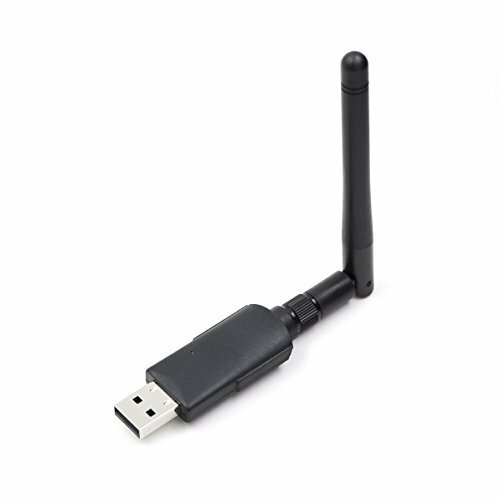 Ultra-fast N300 wifi dongle speed: 802.11n 300mbps speed, compliant with any brand 2.4Ghz 802.11n/g/b router (Not support 5Ghz band). High Gain Long-Range 2dBi removable antenna: The wifi adapter signal transmission distance can reach 100 meters. Much more stable signal, no more drops, moves in full rotation, easy to set it. Wide Compatibility: For Desktop/Laptop/Tablet；Multi-OS support: 32-bit and 64-bit Windows XP/ Vista/ 7/ 8/ 8.1/10/2008r2/2012r2, Raspberry Pi/Pi 2/Pi 3, Mint 14/15/16/17/17.1, Ubuntu 12.10/13.04/13.10/14.04/14.10, Fedora 18/19/20/21, CentOS 6.4/6.5/7 (No need to install driver, Plug and Play), Mac OS 10.4-10.10,Linux ect.